Need a bit of help with your website? Your website is not converting as much as you’d like? Lack clarity on the next steps for your website? Let's take a look at it and optimise it for your business goals. Get a complete review of your website: the good, the bad and the ugly. Receive a clear blueprint on how to improve it. Get your own website coach. We know how difficult it is to build your own website. Sometime the only thing you need is the guidance of a professional. 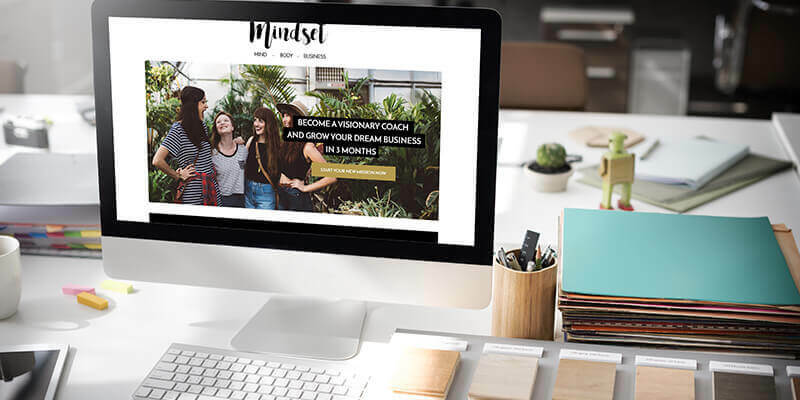 We'll guide you on 1-on-1, day by day to help you launch your website in 5 days. You pick your favourite theme and we make it work for your content and brand. We customise the colours, graphics, fonts, images and insert your content. We design and code a custom website from scratch with a completely unique look, specifically created to reflect the soul of your business. Need a little extra for your website? Want another service, product or lead page? No worries, we can help you with that! We'll create additional pages with a custom design adapted to your content to match the rest of your website. Need extra functionalities to make more money on your brand new website? Let's add ecommerce, membership or booking functionalities to help you automate your site and grow your business easily. Don't know what you should say or how you should say it? Writing is not always the easiest task. We can help you organise and write your content so it is SEO optimised and has the right impact on your visitors. Still have questions about our web design packages? 4. Development period: You will get your brand new website in 5 to 15 days after the beginning of the project! Please make sure that you will be available during the development process. We will be in daily contact with you to keep you updated. A custom website starts at $2100 and a website built from scratch is from $3900. You will receive a 6 pages site in this cost. If you require additional pages, services (logo, copywriting) or more complex functionalities, these can be added to your package at an additional cost. Yes. Once we book your website in our schedule we do not book anyone else. We we want to make sure that people that book us are committed so that's why we have a deposit of 30% of the total cost to pay upfront to secure your development time. Can we add more functionalities/plugins? Of course! We can add: Ecommerce, membership platform, booking system or course and E-learning platform to your site. Simply fill the form below and we'll get in touch within 72 hours. You'll be invited to book a call with us to chat through your project. It is as simple as that! You'll need to have your content (text and pictures) ready for when the development period starts. We'll need it to start the project. Will I be able to change my website myself? Yes! We'll train you for a total of 3 hours on everything you need to know on how to create posts, pages and change the content already created for you. Who is going to do my website? Me, Amande. I have designed all the themes myself and I'll be in charge of developing your website. Please complete the form and we'll get back to you within 72 hours to start discussing your project. Have you used WordPress before?